Q: Can I make my own Will? A: Yes, you can, but you must understand the laws regarding Wills and you MUST ensure that the Will meets the legal requirements in order for it to be valid. 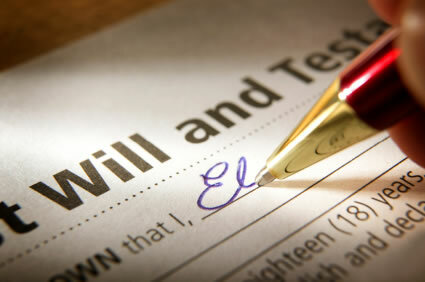 Therefore, I would recommend having someone with legal knowledge prepare your Will. In Trinidad and Tobago, the laws regarding Wills are enshrined in the Wills and Probate Act - Chapter 9:03. The Testator (person writing the Will) must be 18 years old or over and of sound mind, memory and understanding. There must be clear intention to dispose of the property. If a Testator is unduly influenced (coerced or pressured) or forced into making the Will, a Court may set it aside. Similarly, a Court may set aside all or part of a Will if the execution of a Will was obtained by fraud or if it was forged after the person’s death. In the majority of cases, a Will must be in writing for it to be valid, although there are certain exceptions to this general rule. It must also be signed by or on behalf of the Testator, and the signature must be made in the presence of 2 witnesses present at the same time. (6) that to the best knowledge of each of the witnesses the Testator was, at the time the Will was executed, at least eighteen (18) years of age. Any alterations made to a Will after it has been executed, will not be valid unless the alterations have been duly executed (meets all necessary requirements listed above). Q: What happens after death? A: Probate is a process by which a Will of a deceased person is proved to be valid. Probate is the legal process of administering the estate of a deceased person by resolving all claims and distributing the deceased person's property under the valid Will. A probate court decides the validity of a Testator's Will. A Probate interprets the instructions of the deceased, decides the executor as the personal representative of the estate, and adjudicates the interests of heirs and other parties who may have claims against the estate. 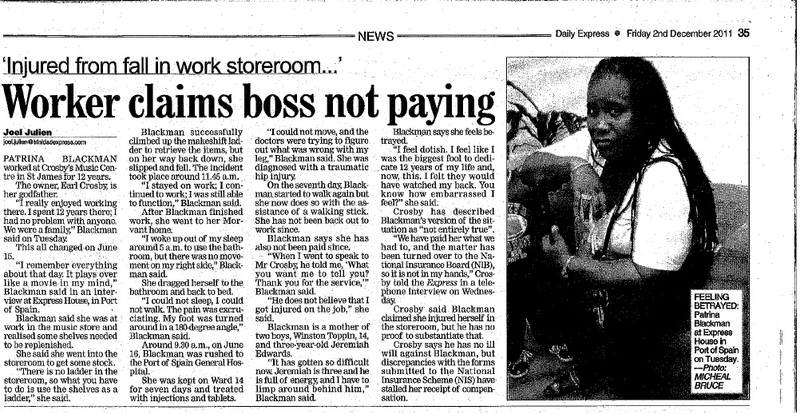 After reading this story on pg.35 of the Trinidad Express this morning, I am appalled by the treatment this woman is receiving despite clear legislation on the issue. The Workmen's Compensation Act 1960 (as amended) is an Act to provide for the payment of compensation to workmen for injuries suffered during the course of employment. 3. Non-manual workers who earn more than $5000 (five thousand TT dollars) a year. This goes to show how antiquated this legislation is, because minimum wage workers make TT$2000 a month. 2(5) - Any injury mentioned under the Second Schedule of the Act is seen as a permanent injury. 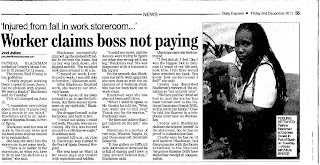 4(2) - Regardless of fault by the employee, any death or serious and permanent dismemberment is the employer's responsibility. Section 5 deals with what and how you should be paid. Part X of the Act has copies of the specific forms to be used when corresponding with your employer on a claim for compensation.